Writing about a new mural going up in the Mission is a bit like pulling a rabbit from a rabbit hutch. But the new mural unveiled last month at Mission and 22nd is eye-catching, even in this corner of San Francisco that nearly manages to have more murals than walls. It’s a large and striking black-and-white representation of Gandhi, Cesar Chavez, Mother Teresa and Martin Luther King, Jr., that combo plate of altruists. The images are sharp and photorealistic; Gandhi, in particular, seems to follow you with his bespectacled gaze as you amble down Mission. It’s titled Dharma Mural, and it’s simply a masterful work from Rigel “Crayone” Juratovac, one of this city’s most renowned muralists. But there are more complex forces at play here than the uplifting images of four secular saints. For one thing, the view from Mission Street onto the building wall now graced by the Dharma Mural wouldn’t have been possible before a massive 2015 fire that gutted an aging and shoddily maintained mixed-use structure. That blaze killed one person and burned 65 more out of their cramped, substandard flats, while also displacing a number of local businesses — including Mission Local. This messy and incongruously vacant lot feels like a scar in the midst of some of most valuable real estate in the history of real estate. It’s the tangible aftermath of what happens when tenants are too desperate for a foothold in this city to complain about trifling things like fire hazards or safety violations. In the Mission, that, too, is a bit like pulling a rabbit from a rabbit hutch. So, in lieu of family housing or retail space we now have a clear view of a serene and uplifting mural. At least until someone builds something here. The funders of Dharma Mural, notably, were Kaushik Dattani and his family. Dattani is a massive Bay Area property owner and — there’s no subtle way to put this — one of the most detested landlords in all the Mission. Protesters outside Kaushik Dattani’s office in February 2014. Photo by Mark Rabine. Dattani has earned a special degree of rancor among Mission tenants’ rights activists by repeatedly wielding the Ellis Act to evict dozens of longtime San Franciscans — including Hilda Lisa Vazquez, an octogenarian known by her neighbors at 19th and Lexington as the lady who woke up at 6 every morning to sweep the sidewalk. 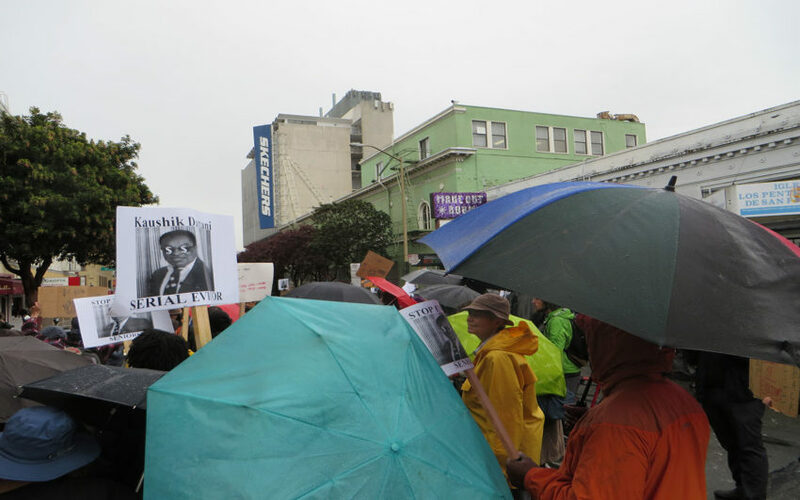 When he acquired 204-214 Capp Street, tenants were purportedly sent a letter informing them that the locks would be changed and they would not get their new keys without providing IDs, Social Security Numbers and other sensitive information — a move that was taken as a clear attempt to intimidate his low-income, undocumented tenants. Dattani did not return several messages left for him at multiple numbers. His former tenants, however, had plenty of stories to tell. There was Tom Rapp, who said that Dattani’s family members would let themselves into the apartment whenever they pleased — which once led his roommate to fear a home-invasion robbery was taking place and hide in the closet. She stayed there until she smelled Rapp cooking dinner, more than an hour later. Both Rapp and that roommate, Patricia Kerman, were eventually Ellis Acted out of their building at Folsom and 20th; Kerman had lived there for 40 years. Christiane Schmidt, who ran the popular German restaurant Schmidt’s, downstairs from Kerman’s apartment, for nearly 10 years — until Dattani purportedly demanded far higher rent and an additional security deposit — said she had to shut down her establishment several times because of structural failures in his decrepit building. There are many, many more stories like this. Suffice it to say, Dattani is not the optimal man to impart the message to remaining Mission residents not yet priced out of the city that they should chill out and be less disgruntled. Dattani is not the optimal man to laud the merits of social justice activists who fought the powerful on behalf of the oppressed and purposely disobeyed cruel and unjust laws. But as a patron of the arts? You could do worse. This divine Michelangelo creation was underwritten by a corrupt and morally dubious patron. Who was also the Pope. And bad people through the years have underwritten much great art. Pope Leo X — aka Giovanni de’ Medici — employed both Michelangelo and Raphael to paint the Sistine Chapel and the Papal Apartments. Their work is breathtaking. So was the scope of corruption under his authority and the massive scale of death and violence unleashed by religious and political strife he failed to address. Closer to our times, John D. Rockefeller famously commissioned Diego Rivera to paint a mural at Rockefeller Center — then had it razed when Rivera inserted leftist political imagery into it. But, notes Mark Johnson, an art professor at San Francisco State and the school’s former gallery director, Rockefeller didn’t raze the artwork of Henry Billings, Louis Bouche, Dean Cornwell, Jose Maria Sert, Ezra A. Winter, Barry Faulkner and many others. You can still go see it today. Prominent patrons of the arts hooked our nation on nicotine. Prominent patrons of the arts hooked our nation on opiods. This is a longstanding problem. There may be no solution. John D. Rockefeller’s demand to remove a politically potent Diego Rivera mural from Rockefeller Center was, in the long run, a terrible business decision. Last year, Fearless Girl was installed on Wall Street. The defiant little four-foot-tall bronze girl was placed across from the famed Charging Bull sculpture. She stared it down like a duelist — and, in so doing, caught the moment. “Empowering” is an overused word (as is “organic” or “holistic”) — but, for many people, this was empowering. And yet, this wasn’t necessarily meant to be empowering. It was meant to move merch. SHE is — cleverly — the stock ticker for State Street’s Gender Diversity Index. This is something you can buy, like soap or Coca-Cola. And yet, whether this crass commercial underpinning invalidates the obvious pride and inspiration so many people derived from this statue is no easy question. It cuts to the very essence of what art is, what art means. If the artwork moves people, does it matter who paid for it? Does it matter what some landlord or some global finance outfit wanted you to think? Taken on its own, Dharma Mural has a message to impart to every passer-by, and it’s up to all of us — and nobody else — to determine what that is. This is a compelling argument. Comforting even. But would Bowes have worked on this project if she knew who was paying for it from the get-go? Her response is unambiguous: No. 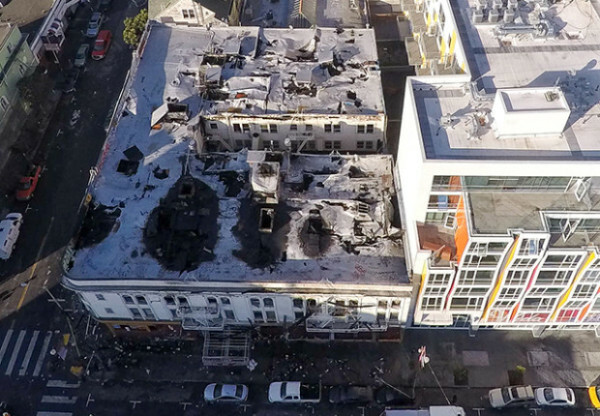 Drone photo by Eddie Codel of the burned-out former structure at the site of Dharma Mural. NextThe Women’s Building competes for $150K grant to retrofit cenutry-old windows. Give them your vote. The irony in having both a landlord known for evicting families and Jo Brewer involved in a peaceful mural in the mission is incredible. Rockefeller tore down the Rivera mural because Stalin didn’t want a Trotskyite working for Rockefeller considering that Rockefeller had oil deals with Stalin. It was Stalin that ordered that the Rivera mural be destroyed or he’d cut the oil valve to Standard Oil. And that’s the way the cookie crumbles.